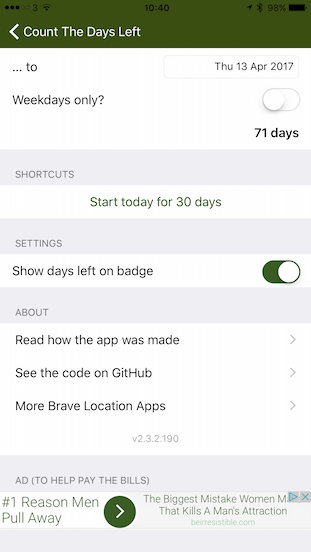 I recently released a version of my Count the Days Left app which included ads for the first time. I thought long and hard before doing this, so I thought it might be interesting to document how I worked through this decision, as it’s pretty typical of the trade-offs independent software developers have to make. I’ve been a commercial software developer for nearly 30 years now (wow! ), including over 10 years working at Microsoft (MSN/Bing/Skype). In 2017 I’m trying to diversify my business more, so the 3 areas above contribute more equally to the bottom line. Currently, by far the biggest part of my income is working on contracts for other people, and I’m trying to generate more independent streams of income so I can be more in control of both my time and where I work. For the first point, I’ve blogged extensively about how I’ve built the app, as well as open sourcing the code on GitHub so potential customers can see my work. The app has been pretty successful in meeting these aims, and has definitely helped in generating business (although it’s hard to measure the actual monetary value of this). As you’d expect from a simple and niche app, it doesn’t have masses of users - daily users are definitely in the hundreds rather than the thousands. In fact, some of the features (showing the days left as an icon badge, the Today widget, plus the Watch complication and app) are designed so the users don’t actually need to open the app every day, but I’m pretty proud of how it’s turned out. Now, unfortunately I suspect there is very little chance I’d sell many copies if I decided to charge for the app. There are so many free competitors to this particular app, and even if my app is better than them - and obvioiusly I think it is :) - it’s very hard to see how many customers would agree. People are now so used to getting high-quality free software, generally from venture capital backed companies who are happy to lose lots of money to capture large audiences in the hope of monitising that audience later. That makes it a very hard sell to convince people even to spend $0.99 on an app that might provide them with lots of value. Personally I’m happy to pay for good software, especially from independent software developers who are doing great work. However I completely understand why most people don’t think in that way, and as I can’t see the situation ever changing, for most consumer apps I can’t see there’s much point in even charging a very small amount. Now this particular app only really does one thing (although hopefully it does it well! ), so I can’t see any sensible way of adding “pro features” to be unlocked by an in-app purchase. I guess I could try a patronage/shareware model, and ask for money to support the app? I’m not sure that would actually generate any money without some sort of persistent nagging which I don’t think I’d be happy with. This probably gets to the nub of my problem with all of this discussion. I’m not sure if it’s a British thing, but the conflict between needing to get paid and somehow seeming to be only doing it work the money is complicated. I do want people appreciate and enjoy the app, and somehow this should be separate from the dirty business of getting paid. So this just leaves adding ads. I didn’t want the app’s main screen to show ads at any time. I think its’ main selling point is it’s a tasteful and good-looking app (especially compared to some of my competitors), and slapping an ad there would completely negate that. Therefore only other place left to put the ads is on the settings page, where you change the title, start and end dates of what you’re counting down to. I’m reasonably happy with this compromise, although from a pure money-making point of view this page is not viewed very often, as the users only go thereevery time they start a new countdown. I’m using Google to provide the ads via AdMob, and have customised them to be text-only and in a color that matches the rest of the app. At least in that way they are not too jarring, and fit in as well as I can make them. In the first week, I’ve made a few pennies - slight more than I expected, which was very little be honest! However, I’m generally happy I’ve done this. I think it’s important all software developers get paid fairly for their work, so turning the tide against the idea all software should be free - even the the smallest way - is OK.
Obviously giving Google even more data is not “free” for my customers, as they are now paying for the app with their information. I’m not 100% happy doing that, but as I’ve hopefully explained here, it’s a complicated trade-off. Feel free to contact me via Twitter at @yeltzland if you have any thoughts on any of this.